Lucre will leverage today’s Ethereum-based Blockchain technology to be future-ready and build further operational efficiencies in the gaming industry of tomorrow. We will provide gaming establishments and sports books with a transparent, secure system for (i) Identity Management through a single KYC and (ii) a cashless/online payment system. Financial transactions like cash-ins and cash-outs will be taken online through the Lucre website/App, converted to Lucre tokens or LCRX - giving the user an option to grow his/her money as the value of LCRX appreciates with further adoption and use within the ecosystem. Lucre will give gaming/gambling establishments as well as their patrons access to an ETH-based, cashless payment system in an auditable, transparent and secure way on Lucre's distributed ledger. In addition, (iii) our platform will also aggregate betting odds from multiple Sports Books to provide users a range of betting options allowing them to place wagers from the Lucre platform. All this will be built on a permissioned Blockchain, for immutable Identity Data Management, digital tokens for payments, incentives and fees in the ecosystem. The system will moreover allow other software specialists to build applications on top the existing system to complement and improve the user experience. This current build will not be hindered by any of these additions. During phase 2 of operations, Lucre will also bring security and capability of the Blockchain to hardware, merging with technology made popular by Fintech, in to casino cages, table games, player bands and rings, and everything tomorrow’s IoT can deliver. Lucre will offer a turnkey service to assist in easy implementation by partner Casinos and Sports Books with the least impact upon existing operations. The Lucre platform is built to address the various pain points experienced by gaming establishments, sports books, and end users/patrons. We are not seeking to re-invent an already well-oiled system, but simply adding a layer of convenience, transparency and safety to it, in the interest of the establishments and patrons. Flexibility and security are incredible advantages that will come with the use of a decentralized system such as Lucre. In addition, the Blockchain enables independent, decentralized transactions, giving the users control and freedom over their finances. "Imagine winning big at the Blackjack table and having to carry around thousands of dollars in casino chips. While it’s great the player won, they now have to carry all of these chips to the cashier to redeem their winnings. With Lucre, players will have the option to cash out right at the Blackjack table, and by the time they select their next table game, their funds will be back in their wallet (on the Lucre app) via the QR reader function." Do you have real case study of casinos working with you based on the above description? Unclear if the execution has taken place with casinos. Thank you for taking the time to review and analyze this project. We had gone over a few details via LinkedIn, but in the interest of transparency I thought I'd post a response here as well. As discussed, I definitely appreciate pinpointing these specific details, especially with regards to time. As I'd mentioned, the milestones are being revised on Bench, and are currently pending confirmation. What's currently on here is just a vaguer outline of what was on the website and what got picked up initially. The dev teams are working tirelessly on getting the app itself published by the end of this calendar year, with a a majority of the functionality we want already built in. With regards to the financials, we actually have upped it a bit as I'd stated, because hardware would be a pretty significant cost, especially when we're looking at integration across entire casinos, their tables, slots... we're targeting the entire ecosystem. Which would mean not just a single machine per cage, but literally at every customer touchpoint. I think that's where the disconnect is in communication honestly. I will have that revised. I look forward to chatting more, though, and picking your brain as well. Your feedback definitely is being taken into account when we revise our communication style. And please feel free to reach out to me directly on @GauravArengChakraverti on Telegram. 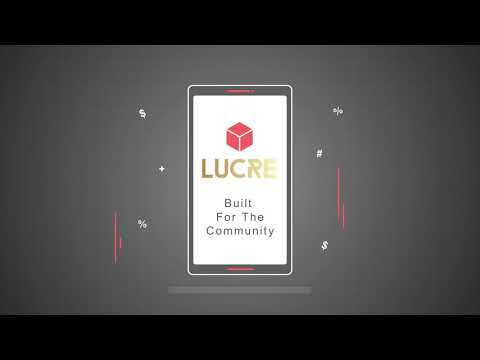 Going a step further, Lucre also brings the security and capability of Blockchain to hardware, merging with technology made popular by FinTech, and brings that to casinos cages, table games, player bands, rings, and everything else tomorrow’s IoT can offer. Efforts to partner with specific top-tier partners - WSOP, WPT, PokerStars, etc.